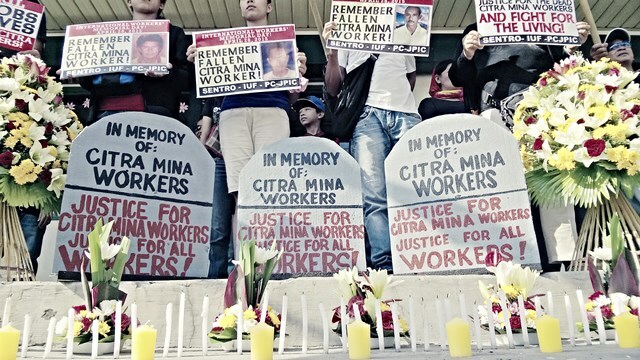 The Citra Mina Workers Union and their national centre SENTRO commemorated Workers Memorial Day with the families of fishing vessel workers declared lost at sea. Over the past two years, at least 17 workers on vessels fishing for the Citra Mina Group are known to be missing or dead and the union continues to investigate other cases. Forty-three fishermen spent nearly six months in prison after being abandoned by Citra Mina when their vessel was seized by the Indonesian government. They were rescued by the union in February. Witnesses at the March 18 hearings in the Philippines Congress on rights violations by the Citra Mina Group described slave-like conditions on fishing boats and deaths on the high seas together with systematic and ongoing violations of trade union rights.